>> … it would be interesting to hear people’s experience of individual artworks–have you ever seen an artwork that moved you, disgusted you, interested you, disinterested you…? If so, why? What was it about that artwork that was effective / ineffective? Ben Quilty’s “After Afghanistan” series of paintings – example, his Captain S After Afghanistan painting. the pose and expression on the face and application of paint in such thick strokes and the mix of colours and expressive marks/brushstrokes & use of light and dark/shadow evokes strong emotions in me — in both the technique of the painting and the subject and meaning behind it. Ben Quilty. Captain S After Afghanistan. 2012. Oil on linen. Archibald Prize, Art Gallery of NSW. 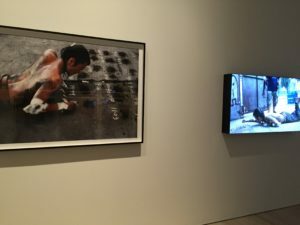 http://www.benquilty.com/news.php. 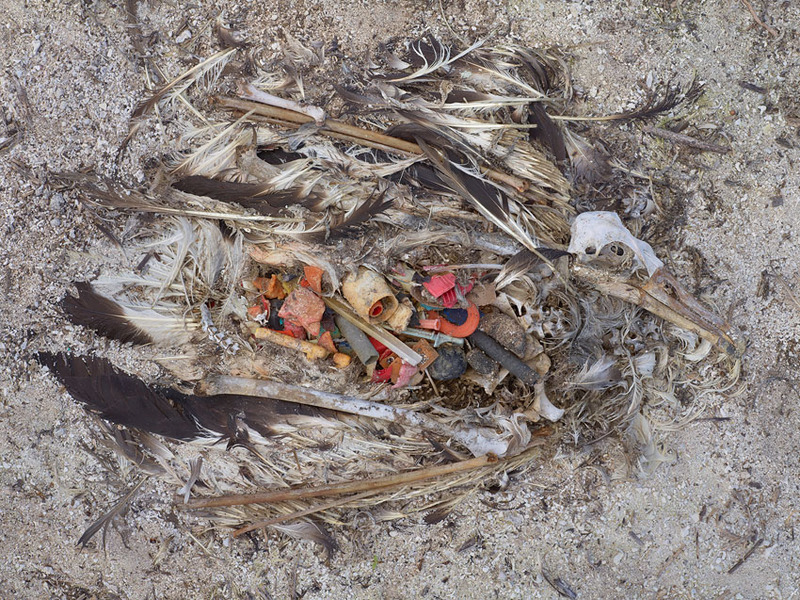 when I first saw Chris Jordan’s photographs of dead sea birds with stomachs full of plastic. it wasn’t the technical properties of the photo that disgusted me — it was the scenario and the thought of the poor birds eating all the plastic waste of ours. and that this wouldn’t be an isolated case. I was more disgusted at human beings for being so wasteful and causing harm to such beautiful creatures than the actual images, which are disturbing to see. Chris Jordan. Midway: Message from the Gyre. (2009 – Current). Photograph. http://www.chrisjordan.com/gallery/midway/#CF000677%2017×22. Fred Williams’ Trees on Hillside II interests me due to the painting technique. The blobs and dabs of paint on the hardboard up close looks like Williams has just blotted random brush wipes of paint onto the surface, but when you see the painting from a distance you see the landscape and environment emerge. The colours in the blobs of paint blend. It reminds me of a deconstructed pointillism work, with the dots of paint widely spaced instead of close together. It amazes me that just a few dashes of brushstrokes can be so expressive and a modern version of the traditional landscape or rural painting. Fred Williams. Trees on Hillside II. 1964. 91.4 x 121.9 cm. Oil, tempera on hardboard. Art Gallery of NSW. 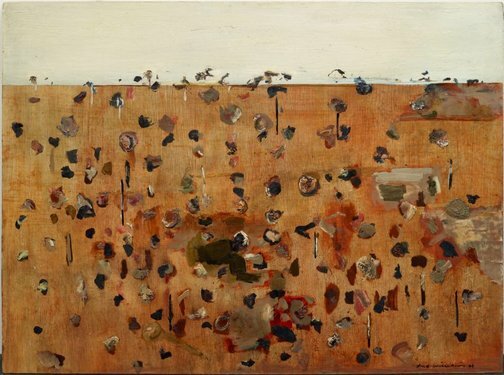 http://www.artgallery.nsw.gov.au/collection/works/OA6.1965. the problem with art that disinterests me is that it usually means I don’t know enough about it and I’ve based my reaction on my initial aesthetic response to the work or what I think the work is about. once I find out more about the work, then it becomes more interesting. 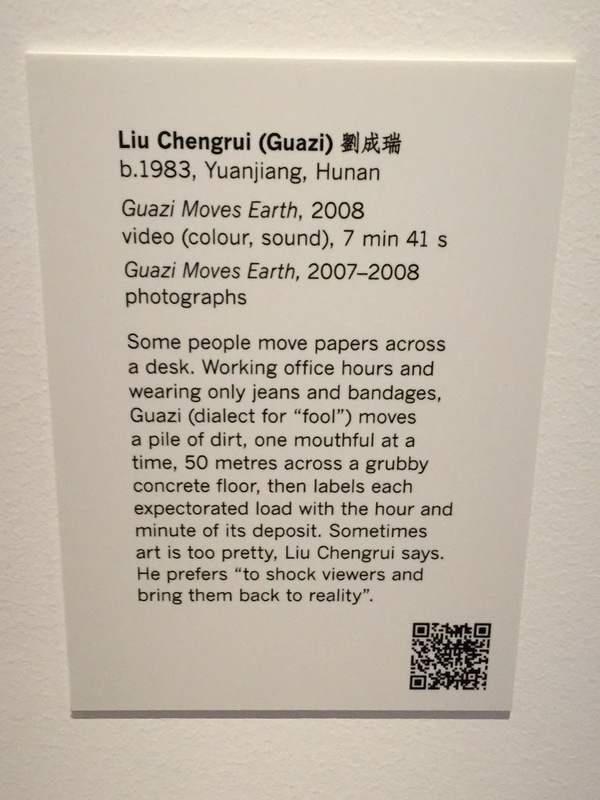 for example I saw a video of Liu Chengrui (Guazi)’s work, Guazi Moves Earth (2008), during a recent visit to White Rabbit Gallery in Sydney. 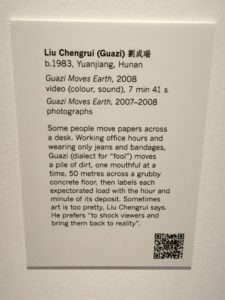 at first I wasn’t really interested in finding out more, but as I walked around more and then read the artwork label/description, it became more interesting to me due to the artist’s idea behind the work. at first I was thinking, what’s this guy doing lying on his stomach and shuffling along the ground. once I learn more about the concept I appreciated the pose of the artist and the resulting art work. >> Does it help to know about the historical / conceptual background of the artwork or is it better to experience it without prior knowledge? 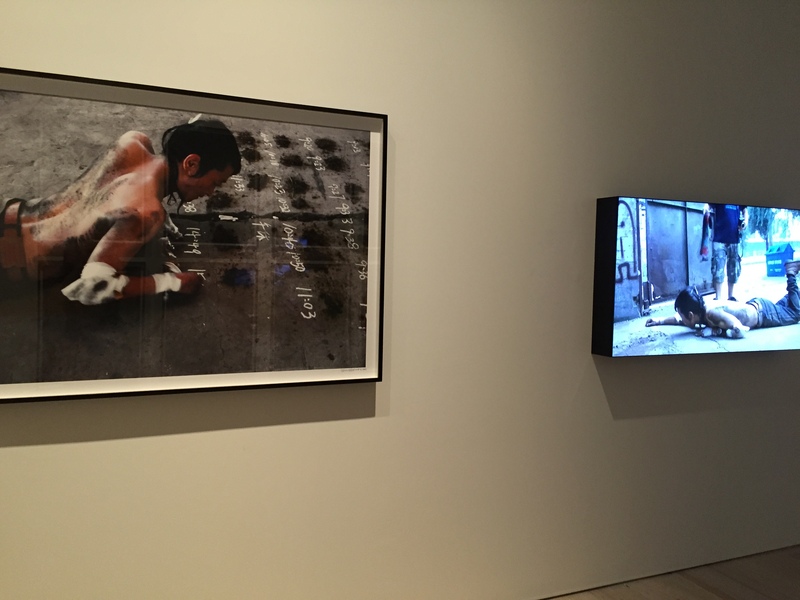 I think it depends on the work — some work I can see on its own without an explanation, but for more conceptual / experimental / performance art work I often prefer to find out what the ideas of the artist were so I can understand the context better.